Welcome to Grapevine Physical Therapy & Sports Medicine's patient resource about Cervical Spine Problems. Knowing the main parts of your neck and how these parts work is important as you learn to care for your neck problem. Two common anatomic terms are useful as they relate to the neck. The term anterior refers to the front of the neck. The term posterior refers to the back of the neck. The part of the spine that moves through the neck is called the cervical spine. The front of the neck is therefore called the anterior cervical area. The back of the neck is called the posterior cervical area. This section highlights important structures in each category. The human spine is made up of 24 spinal bones, called vertebrae. Vertebrae are stacked on top of one another to form the spinal column. The spinal column is the body's main upright support. The first seven vertebrae make up the cervical spine. 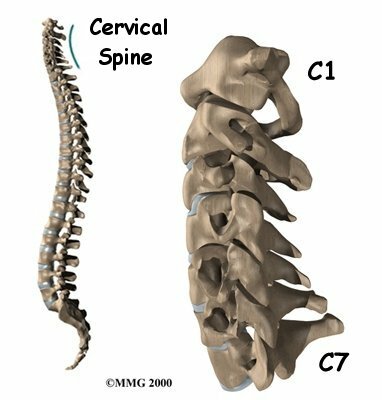 Doctors often refer to these vertebrae as C1 to C7. 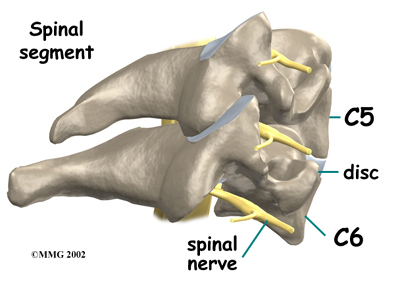 The cervical spine starts where the top vertebra (C1) connects to the bottom of the skull. The cervical spine curves slightly inward and ends where C7 joins the top of the thoracic spine (the chest area). The base of the skull sits on top of C1, also called the atlas. Two thickened bony arches form a large hole through the center of the atlas. The opening is large because the spinal cord is wider where it first exits the brain and skull. 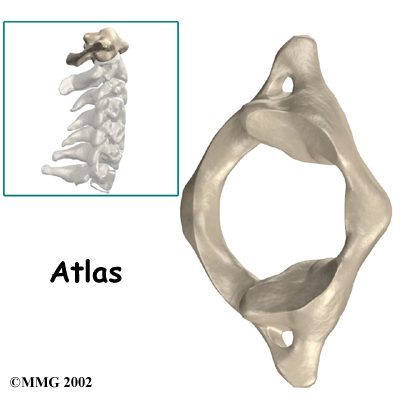 Compared to other vertebrae, the atlas also has much wider bony projections pointing out to each side. 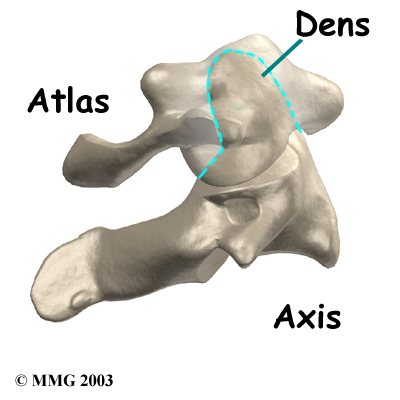 The atlas sits on top of the C2 vertebra. The C2 is called the axis. The axis has a large bony knob on top, called the dens. The dens points up and fits through a hole in the atlas. 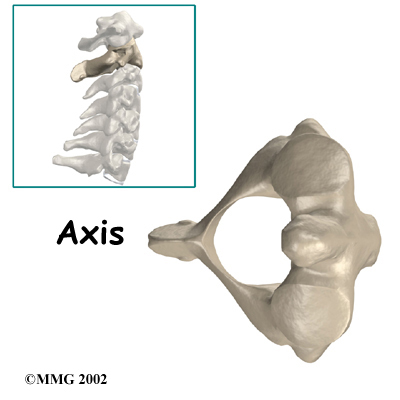 The joints of the axis give the neck most of its ability to turn to the left and right. Each vertebra is made of the same parts. The main section of each cervical vertebra, from C2 to C7, is formed by a round block of bone, called the vertebral body. A bony ring attaches to the back of the vertebral body. This ring has two parts. Two pedicle bones connect directly to the back of the vertebral body. Two lamina bones join the pedicles to complete the ring. The lamina bones form the outer rim of the bony ring. When the vertebrae are stacked on top of each other, the bony rings form a hollow tube that surrounds the spinal cord. The laminae provide a protective roof over the spinal cord. 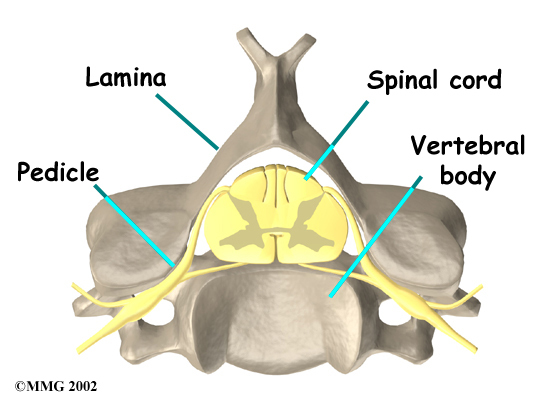 A bony knob projects out at the point where the two lamina bones join together at the back of the spine. These projections, called spinous processes, can be felt as you rub your fingers up and down the back of your spine. The largest bump near the top of your spine is the spinous process of C2. At the base of the neck where the cervical and thoracic spines join together, you'll feel another large spinous process. That's C7. Each vertebra in the spine has two bony knobs that point out to the side, one on the left and one on the right. These bony projections are called transverse processes. 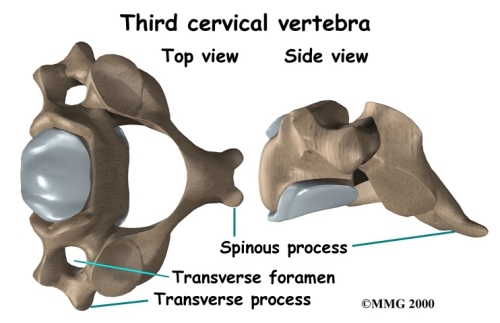 The atlas has the widest transverse processes of all the cervical vertebrae. Unlike the rest of the spine, the neck vertebrae have a hole that passes down through each transverse process. This hole, called the transverse foramen, provides a passageway for arteries that run up each side of the neck to supply the back of the brain with blood. Between each pair of vertebrae are two joints called facet joints. These joints connect the vertebrae together in a chain but slide against one another to allow the neck to move in many directions. Except for the very top and bottom of the spinal column, each vertebra has two facet joints on each side. The ones on top connect to the vertebra above; the ones below join with the vertebra below. The surfaces of the facet joints are covered by articular cartilage. Articular cartilage is a smooth, rubbery material that covers the ends of most joints. It allows the ends of bones to move against each other smoothly, without friction. 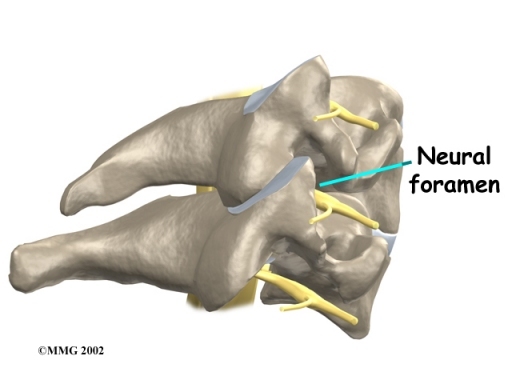 On the left and right side of each vertebra is a small tunnel called a neural foramen. (Foramina is the plural term.) 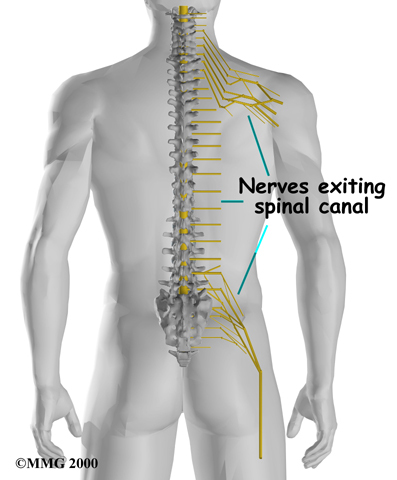 The two nerves that leave the spine at each vertebra go through the foramina, one on the left and one on the right. The intervertebral disc (described later) sits directly in front of the opening. A bulged or herniated disc can narrow the opening and put pressure on the nerve. 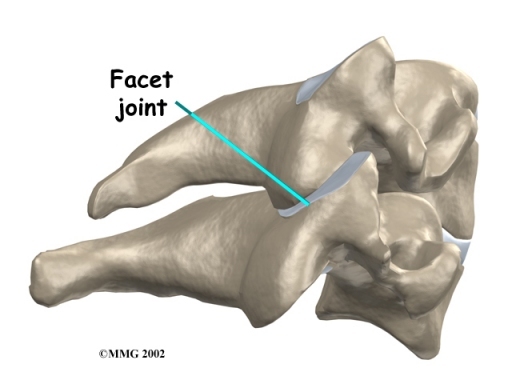 A facet joint sits in back of the foramen. Bone spurs that form on the facet joint can project into the tunnel, narrowing the hole and pinching the nerve. The hollow tube formed by the bony ring on the back of the spinal column surrounds the spinal cord as it passes through the spine. The spinal cord is a similar to a long wire made up of millions of nerve fibers. Just as the skull protects the brain, the bones of the spinal column protect the spinal cord. The spinal cord travels down from the brain through the spinal column. Two large nerves branch off the spinal cord from each vertebra, one on the left and one on the right. The nerves pass through the neural foramina. These spinal nerves group together to form the main nerves that go to the limbs and organs. The nerves that come out of the cervical spine go to the arms and hands. Ligaments are strong connective tissues that attach bones to other bones. (Connective tissues are networks of fiber that hold the cells of the body together.) Several long ligaments connect on the front and back sections of the vertebrae. The anterior longitudinal ligament runs lengthwise down the front of the vertebral bodies. Two other ligaments run full length within the spinal canal. 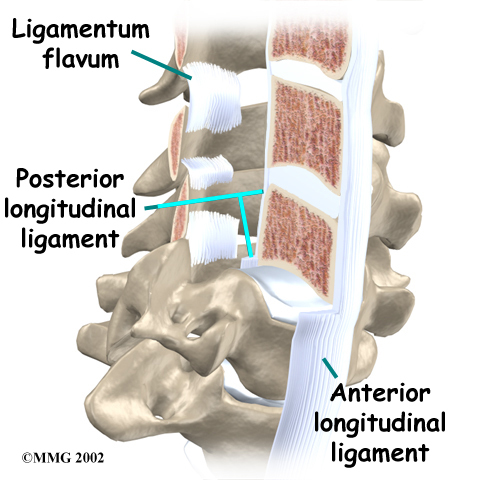 The posterior longitudinal ligament attaches on the back of the vertebral bodies. The ligamentum flavum is a long elastic band that connects to the front surface of the lamina bones. A special type of structure in the spine called an intervertebral disc is also made of connective tissue. The fibers of the disc are formed by special cells, called collagen cells. The fibers may be lined up like strands of nylon rope or crisscrossed like a net. 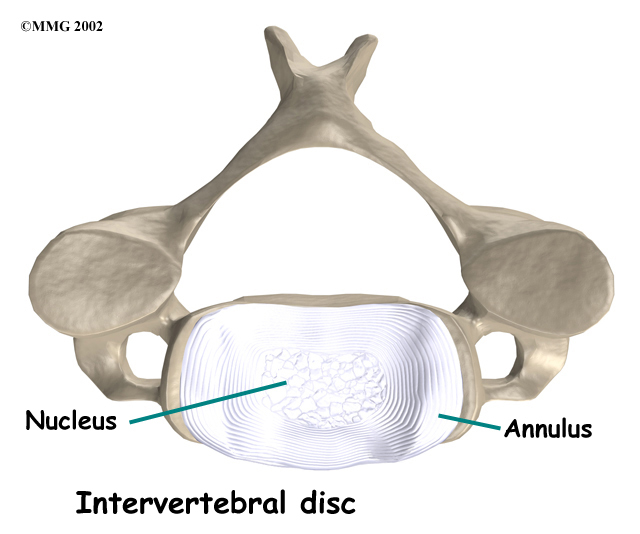 An intervertebral disc is made of two parts. The center, called the nucleus, is spongy. It provides most of the shock absorption in the spine. The nucleus is held in place by the annulus, a series of strong ligament rings surrounding it. The anterior cervical area is covered with muscles that run from the rib cage and collar bone to the cervical vertebrae, jaw, and skull. The posterior cervical muscles cover the bones along the back of the spine and make up the bulk of the tissues on the back of the neck. A good way to understand the anatomy of the cervical spine is by looking at a spinal segment. Each spinal segment includes two vertebrae separated by an intervertebral disc, the nerves that leave the spinal cord at each vertebra, and the small facet joints that link each level of the spinal column. The intervertebral disc separates the two vertebral bodies of the spinal segment. The disc normally works like a shock absorber. It protects the spine against the daily pull of gravity. It also protects the spine during heavy activities that put strong force on the spine, such as jumping, running, and lifting. The spinal segment is connected by a facet joint, described earlier. When the facet joints of the cervical spine move together, they bend and turn the neck. Many important parts make up the anatomy of the neck. Understanding the regions and structures of the neck can help you be more involved in your health care and better able to care for your neck problem.